Turkey on Saturday condemned Friday's bombing targeting an election rally in southwest Pakistan. "We condemn in strongest terms the attacks on Pakistan's democracy and stability," presidential spokesperson Ibrahim Kalın told Anadolu Agency. 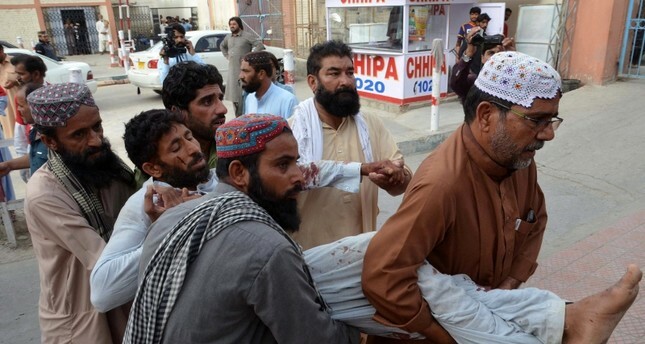 At least 128 people were killed and hundreds injured when a suspected suicide bomber detonated himself in an election rally in the remote Mastung district of Balochistan province. "The Republic of Turkey, with its state and nation, stands together with its Pakistani brothers and sisters, as it has always done," Kalin added. Newspapers branded the blast -- one of the deadliest in Pakistan's history -- a "massacre", as analysts and media called on the military to, in the words of the daily Dawn, "do the job they are meant to do -- ie preventing attacks". Hospitals in the area have been placed under "emergency" management after being overwhelmed in the hours after the attack, with around 150 also wounded in the blast -- many still in critical condition. "I could hear voices screaming. I tried to get up and I saw people trying to run towards the gate. They were trampling over dead bodies," survivor Rustam Raisani told AFP from his hospital bed. "We have imposed emergency (management) in the hospitals and canceled the vacations of the doctors and paramedics," Balochistan home minister Agha Umar Bungalzai told AFP. The provincial home secretary Haider Shako added that extra security forces had been deployed in "sensitive areas" and warned politicians to remain "vigilant". A caretaker government has been installed ahead of the July 25 election, and prime minister Nasirul Mulk declared Sunday would be a day of mourning. The attack was by far the deadliest of a series of blasts at various campaign events this week that have killed at least 154 people, including two local politicians, and underscored ongoing security challenges following years of optimism over improvements. Security analyst Rahimullah Yusufzai termed the blasts a "wave of terror" that indicated coordination between militant groups, and noted that security forces could not protect every single campaign event. He predicted the bloodshed would continue "until the election and even after". Violence has dropped significantly since the country's deadliest-ever militant attack, an assault on a school in the northwestern city of Peshawar in 2014 that left more than 150 people dead, mostly children. The military intensified operations against militants in the tribal areas along the border with Afghanistan in the wake of that attack, and security has improved dramatically.